Safety railing systems are a vital part of keeping any workplace safe and OSHA compliant. Anytime there is a fall hazard, placing a guardrail between you, the worker, and the hazard is your best option. However, what does OSHA require for your safety railing? OSHA will require that the railing be 42” tall from the working/walking surface. From there, you will need a rail halfway between the top rail and the working/walking surface. The rails must be able to withstand a 200 lb. force and toe board will be needed if anyone is likely to walk underneath the area of work. Anytime you are exposed to a fall indoors, some sort of railing or guardrail system should be in place. Examples would include areas like mezzanines, loading docks, and certain areas in a warehouse. Given the nature of such environments, safety yellow railing may be ideal. The hi-vis view of a safety yellow guardrail allows people to be more visually aware of the hazardous areas. This spark of attention is great, especially when the hazards are less known or easily missed. With loading docks the fall may only be about 48”, but being unaware of the fall hazard can lead anywhere from twisting an ankle to traumatic head injuries. If being exposed to the environment is a concern for corrosion, our we offer an aluminum safety railing option. Mezzanine safety railings are crucial to you and your employee’s safety. Using a modular safety railing design, you can incorporate the railing into a pallet gate or ladder system. When all the components of a mezzanine are well integrated, it leaves zero holes for people to fall through. Rooftops are notorious for the fall hazards. Having the proper safety railing in place can reduce or eliminate all the fall hazards. The issue arises that not all rooftops are the same. Fortunately, we have safety railing systems for almost any roof type. The most common and easiest to install would be KeeGuard, our non-penetrating rooftop guardrail. These industrial guardrails will sit directly on your rooftop, requiring zero penetrations. It’s always best when you can protect your workers without destroying your roof surface. 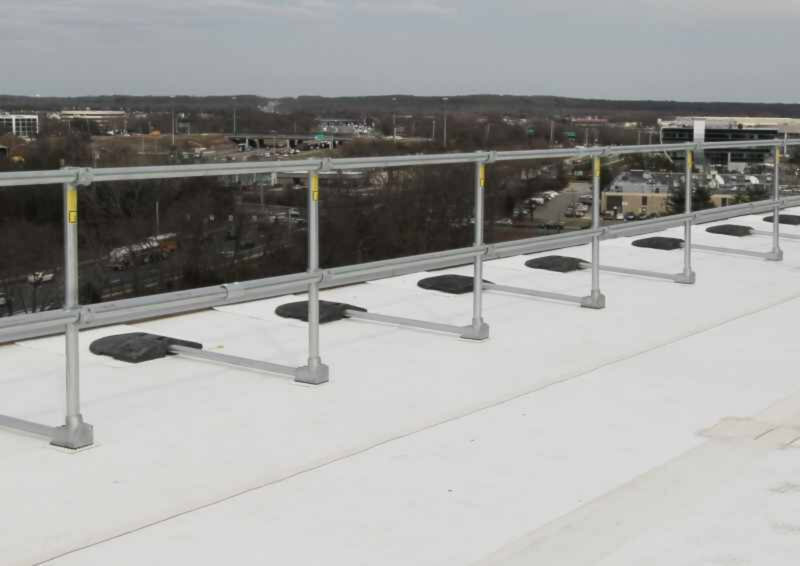 Anytime you have a structural parapet available, and it is shorter than the OSHA required height of at least 39”, parapet mounted safety railing is a great option. Using modular pipe and fittings, the parapet mounted guardrail can fasten directly to the vertical portion or sit flush on the top of the parapet wall. Once the flanges are attached, you can simply slide the rails through your vertical posts to complete the install. Metal rooftops are traditionally difficult to protect. But if you have a corrugated or standing seam roof, we have a metal safety railing for that design. Using adjustable plates to span the distance over the ribs, you can quickly fasten your posts onto the metal roof. Sometimes you just need a temporary safety railing for a quick job or on your construction site. 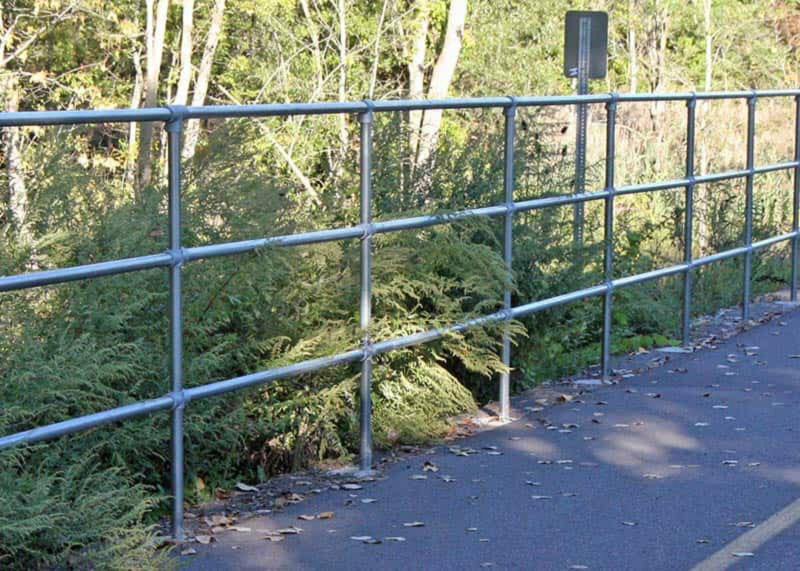 With our wide variety of options, we have a construction guardrail system made specifically for your application. Depending on your job site, you may need something that temporarily mounts directly into wood, metal or cement. Or maybe you need something that is non-penetrating. 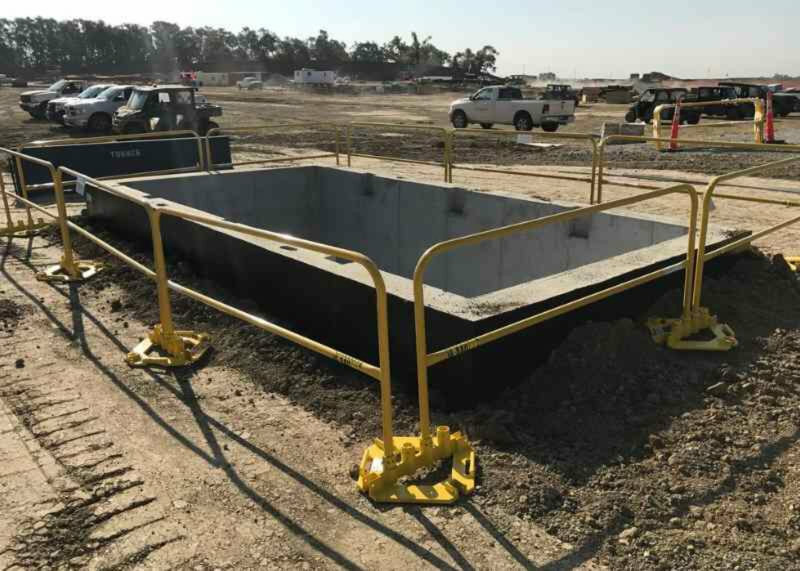 Our non-penetrating options include systems that sit directly on the surface with weighted bases, while others clamp onto existing structure such as parapet walls or concrete slabs. Some railing systems come with rails while others just standard 2x4’s as the guardrail. The benefit to using 2x4’s for guardrails is that these are very inexpensive and readily available on most construction sites. In addition, the uprights used for the railing are smaller and more easily transported to and from locations.